The "Swing Headshell" is an another short arm for your turntable. Due to it having a soft joint, short and light arm with a 'Swing Headshell' can track a groove more delicately with better balance. Nasotec Swing Headshell SPU rear connection - SME type connector. Click image to read the review! Nasotec Swing Headshell SPU side view. Nasotec Swing Headshell SPU underside. Little difference between inner and outer groove tracking performance - the well-balanced swing will improve the groove tracking through all the record tracks. To make it easy to understand what the Swing Headshell is, consider that the Swing Headshell is like another short tonearm. Due to having a soft joint; this short and light arm can tracked a groove more delicately with well-balanced forces. How can that be possible? The stylus can enter deeper into the groove, with its light and flexible swing, and track both sides of groove with well-balanced force. More unwanted vibration occurring in a cartridge is dissipated away through the joint and an extremely small amount of the vibration is transferred to the arm. According to Nasotec's comparison test of tonearm resonance, they found the arm equipped with the "Swing Headshell" is superior to any other common type of arm existing at present for the tonearm resonance. Due to the joint, the resonance is reduced further than a directly connected headshell to tonearm. 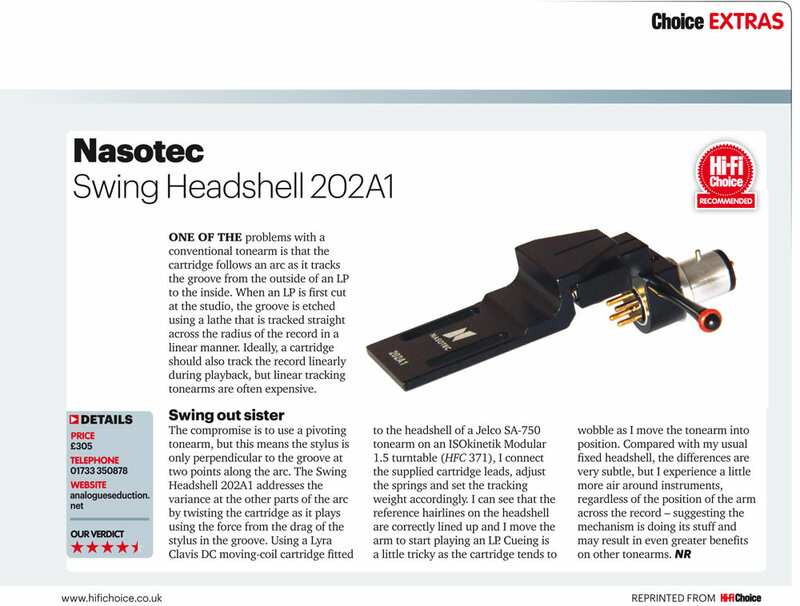 Example: pulling apart previous headshell to install into the Nasotec Swing Headshell SPU.